All 23 trophies were presented to the winning crews by Sir Steve Redgrave and Dame Katherine Grainger. It was a mixed bag for Leander in their final two events of the day, with disappointment for the crew in the Hambleden but another record-busting win for Leander in the Queen Mother Challenge Cup quad competition. The crew won by four and a half lengths in a time of 6.14, setting a record time to both Fawley and the Barrier. John Collins, 29, in the bow seat told the Henley Standard afterwards. "It's always a challenge when you have a straight final. You only have one chance to get it right, and you have to make sure nothing puts you off. We were very much trying to stay in our boat. I was doing the steering, which is a bit more pressurised at Henley. It's not as easy as when you're in lanes on a straight course so I had to keep aware on where I was steering. The only other big change is the distance. We're used to going for five and a half minutes whereas this is six and a quarter which is quite a big difference for us. We're competing at the World Cup in Lucerne next weekend so we can't celebrate too much. It's a big win for Tom [Barras, who was in the crew] because it's his first Henley win. That's a special day in anyone's career. "One of my coaches always says there's no point in training so hard if you don't celebrate your successes, so we'll sit down and have a few Pimms with our families to celebrate." With all this afternoon's races now complete, Pimms seems the plan of most people on the riverbank this afternoon, especially while awaiting the prize giving, which will be up shortly. The Henley Standard team will be updating with photographs and reaction from this final part of what has been a thrilling day's racing shortly after the official prizegiving at 5pm. Well we're back from lunch and not only do we have news of two more victorious Leander crews, but we also have records falling steadily. In the women's coxless fours, the University of London and Leander Club composite crew beat Molesey Boat Club by one and three quarter lengths in 7.22, setting a new record for the event. Speaking to the Henley Standard afterwards, Leander's Emily Ford, 23, in the two seat said: "That was very hard work. We set out to try and break the record so we went off really really fast. By the time I got to the enclosures I think was flagging a bit, I could feel myself going lower and lower into the boat. When you race at Henley with the crowds it makes you nervous because if someone messes up it can give the other crew a chance to get back into it. We didn't go into the race expecting to win, because if you do that you can let the opposition step up and beat you." Immediately afterwards in the Visitors' Leander Club beat University of London by two lengths in a time of 6.31, a course record in this event, shaving two seconds off the existing one. Ross Jarvis, 23, in the Visitors' Challenge Cup crew, two seat said: "When you're racing at Henley it's basically a drag race, so you get in front and you stay in front. We tried hard to go off fast in the first half, and just kept it going from there. When you are racing here with the crowd it mights rowing a bit more like other sports where you have other people cheering you on. Rowing can be a bit quiet." For Jarvis the successful finish of this regatta campaign is somewhat poignant - he is retiring from rowing after this race. He said: "I'm really happy to be finishing on such a high in this fantastic way. I'm now going to London to get a job and take up triathlons!" Leander is celebrating another win in the Double Sculls Challenge Cup. Angus Groom and Jack Beaumont won by five lengths against the Irish O’Donovan brothers in a time of six minutes 46 seconds, beating the record by two seconds. Groom, 26, said: “I’m absolutely ecstatic. We got the start we wanted, had a really good row and job done. We love racing in the boat together. You could tell at the start we were both a bit nervous but that’s when we get the best out of each other. We made our move at the right time and didn’t give them any mercy at all. It never feels at the time like you’re five lengths up, we wanted to keep going to the finish line. We always try and go faster and faster and we did that today. “The crowd was very loud as it was a lunchtime race and there were loads of people out there. Big crowds all the way along the bank and it’s something we don’t get anywhere else. Spectators are enjoying luncheon now, and the first Leander race back following the break will be at 2.50pm so join us then for more results and reaction from the water. 12.50 update: Leander hits 200 at 200! Leander are celebrating success in the Stewards’ Challenge Cup. The crew won by two and a half lengths in a time of 6.24. Their time at the barrier was 1.50, equalling the record established by Leander and Molesey Boat Club in 2011. LEANDER Club will contest seven events as finals day at Henley Royal Regatta gets underway later this morning (Sunday). 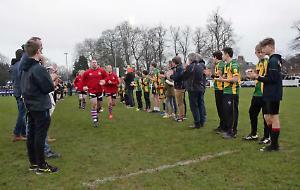 The club is celebrating its bicentenary and with 199 trophies to its credit since the club first won the Grand Challenge Cup in 1840 it is set to record the 200th win to mark 200 years of history. The milestone is guaranteed as the two GB men’s fours — the only entries in the Stewards’ Challenge Cup — both contain Leander athletes. This will be the club’s first final today at 12.10pm and will pit an all Leander coxless four against a Leander and Oxford University composite crew. This will be followed by the final of the Rememham Challege Cup at 12.40pm where a Leander and University of London composite crew will race National Training Centre, Australia. In the last race before the luncheon interval at 1pm Jack Beaumont and Angus Groom will be looking to get the better of the O’Donovan brothers in the Double Sculls Challenge Cup. Beaumont won the event in 2016 with clubmate Nick Middleton and a win today would mean a seventh consecutive victory at Henley. At 2.50pm a Leander and University of London composite crew will race Molesey Boat Club in the final of the Town Challenge Cup and at 3pm Leander will be looking for another strong performance in the final of the Visitors’ Challenge Cup, an event they won last year. Rowan McKellar and Hattie Taylor, both of Leander, will be racing at 3.40pm in the Hambleden Challenge Cup against H Long and H Scott. At 3.50pm a Leander and Agecroft Rowing Club crew will race Fana Roklubb, of Norway, in the decider for the Queen Mother Challenge Cup. Prizegiving will take place at 5pm in the Stewards’ Enclosure.